Sorry for the long quietude around here, but really, I have a great excuse! And here she is, getting a last hug from her West Coast Nana. 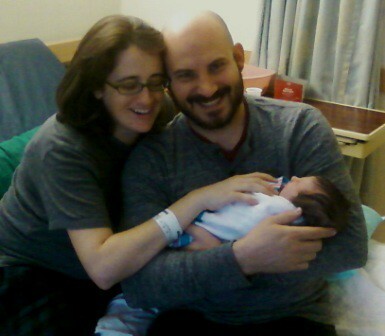 Oona Buzz Szwajkos was born on December 6th, a perfect and petite little thing at just 7 pounds. She and her proud momma and daddy are doing just great, and I was lucky enough to be in NYC when she was born. She is my first grandchild, and so far I am exceeding all the stereotypical grandma craziness. 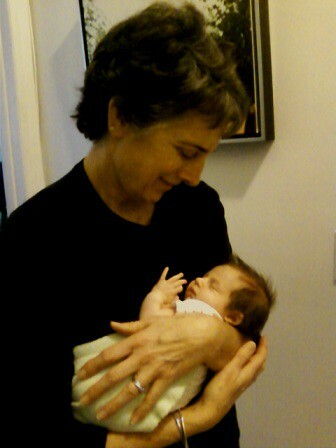 Of course I am totally smitten with her, and yes it was really hard to leave her in New York. I plan on making many trips east in 2012. 🙂 Look how cute she looks with her momma and daddy, getting ready to come home from the hospital. Between new grandbaby and the holiday craziness, I haven’t had 2 minutes to update my blog. As you may have noticed. But I promise to get back on track once all the festivities are over, the house is semi-put-back-together, and all the adult-children-houseguests have returned to their own living quarters. Merry Christmas, Happy Hannukah, Happy Kwanza, and Joyful Winter Solstice to all! Pamela, can you tell us a little about your personal history with the art of sewing? I have been teaching sewing since 1981, and I specialize in pattern fitting and fine garment skills. My passion is really creating garments that flatter and fit the wearer, which is why I use the Palmer/Pletsch pattern fitting method. After working with hundreds of women through the years, I developed Pamela’s Patterns, which include many fitting solutions and built-in pattern adjustment options. 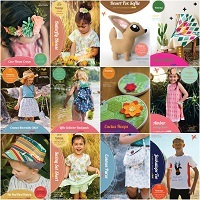 My patterns have been reviewed and featured in Threads and Sew News Magazines, Sawyer Brook Distinctive Fabrics, Patternreview.com, Gorgeous Fabrics, and Nancy’s Notions and Clotilde Catalogs. I have also been a contributing writer for Threads Magazine, Creative Publishing, and Janome, and I teach for sewing guilds, stores, and conferences. In 2012, I will be joining Pati Palmer to host The Palmer/Pletsch East School of Sewing at Steve’s Sewing, Vacuum and Quilting in King of Prussia PA (congrats Pamela!). We are planning on offering the Pattern Fitting and Pants Fitting classes, and I am so excited about this wonderful new opportunity. 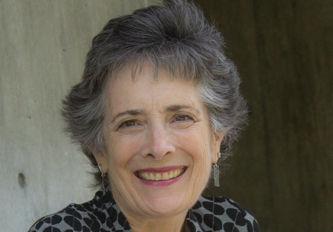 Pamela, do you first and foremost consider yourself a designer or an instructor, and why? I consider myself an instructor who designs. I love to teach, especially fitting, garment sewing and sergers. My pattern line developed from making patterns for my customers to help them with a better fit, and then expanded from there. I am basically a self taught pattern maker, which means that I do not have a degree, but have studied a lot on my own, taken classes whenever possible, and have tons of trial, error and prototype experience! 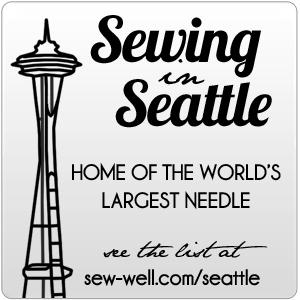 Who (or what) is your favorite sewing inspiration? My sewing mentors are Pati Palmer (Palmer/Pletsch), Ann Person (Stretch and Sew), Kwik Sew Pattern Company, Martha Pullen (Sew Beautiful), Nancy Zieman (Nancy’s Notions) and Judy Barlup (Unique Techniques). Pamela, who is your favorite designer? Do I have a favorite? My favorites don’t have anything to do with what I actually design. They are mostly high fashion that I just love to absorb, even though I rarely make anything like that. Betsey Johnson, Karl Lagerfeld, Prada, Elsa Schiaparelli are among my favorites. What is your favorite part about owning a creative business? I love meeting other women who sew and create, exchanging ideas, and being responsible for what I do and accomplish (see below). What is your biggest struggle with owning a creative business? Being responsible for what I do and accomplish! You see, there doesn’t ever seem to be enough hours in a day for all that I want to get done. Time management is the hardest thing there is! I think I need to be superwoman! What is the next “big thing” you want to do with your business? Finish my new slacks pattern and instructional DVD. I am driving myself crazy with it. I tend to be a perfectionist, and just when I think it is ready, I think of more I want to do. have attended the best design school in the world! Thank you so much for sharing yourself with us Pamela, and best wishes on getting your slacks pattern wrapped up and the new Palmer/Pletsch East School started. I hope to see you in another class sometime soon!